As humane as Seth Gordon’s documentary The King of Kong: A Fistful of Quarters was, his comic noir Horrible Bosses is heartless. Worse yet, this uninspired mess of a movie has no idea what it should do once it gets its mean-spirited premise out onto the table. In the hands of true satirists (the Coen Brothers immediately spring to mind) a film about a group of downtrodden salary men who conspire to dispatch each others’ awful employers could remind us all of the hell of the working world and put a grin on our faces while doing it. With Gordon at the helm, the set-up simply grows increasingly unpleasant. Although Horrible Bosses would have you believe, as the opening Spoon song implies, that it is rooting for the underdog, these thoroughly unlikeable protagonists do little to inspire us to cheer them on. Only the biggest malcontents in the audience will be able to root on their supremely self-centered plots to murder their bosses. A weak cast, largely comprised of television sitcom castoffs, does little to improve things. Kevin Spacey is clearly the standout here, although he is delivering a warmed-over version of the more-fully formed performances that he delivered in past films such as Swimming With Sharks and The Big Kahuna. Knowledge of those movies, which genuinely sought to contend with the ethnics of the work we do and the relationships we form in the workplace, reveal Horrible Bosses as the hollow exercise that it is. 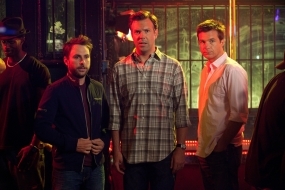 Supposedly scandalous in its ribald humor and lack of moral messaging, Horrible Bosses would be hard-pressed to shock the average frat boy (seemingly its target audience). Most of the reason for the film’s R-rating seems to come from the off-color language peppered throughout the dialogue. This moronic screenwriting through swearing does little to generate laughs and only would appear to represent creative freedom or boundary pushing to a cast used to working under television censorship laws. Midway through its run time, Horrible Bosses goes out of its way to name-check Strangers on a Train and Throw Momma from a Train. Despite lifting its plot from both, it withers in comparison to either. The former title suggests that the scenario is squandered with a juvenile approach and raises the question of why there is zero suspense here at all. The invocation of the latter reminds us that Horrible Bosses is not nearly as horrible a black comedy as it seems to think it is.